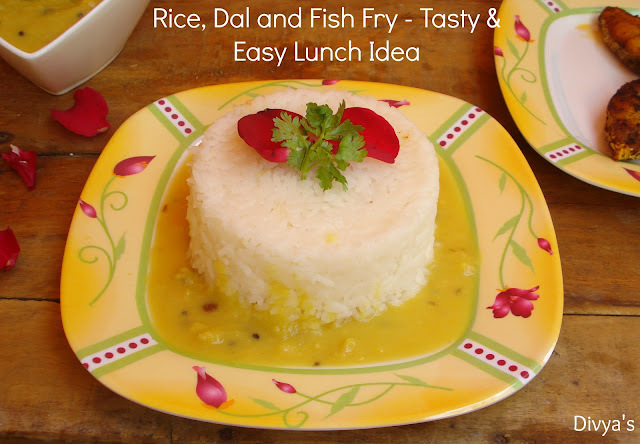 How about rice without gravy?? 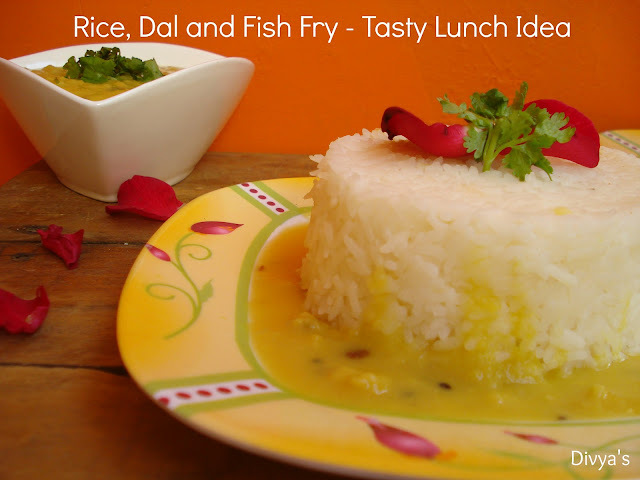 Or rice without any sides?? That can never be a perfect idea for lunch. 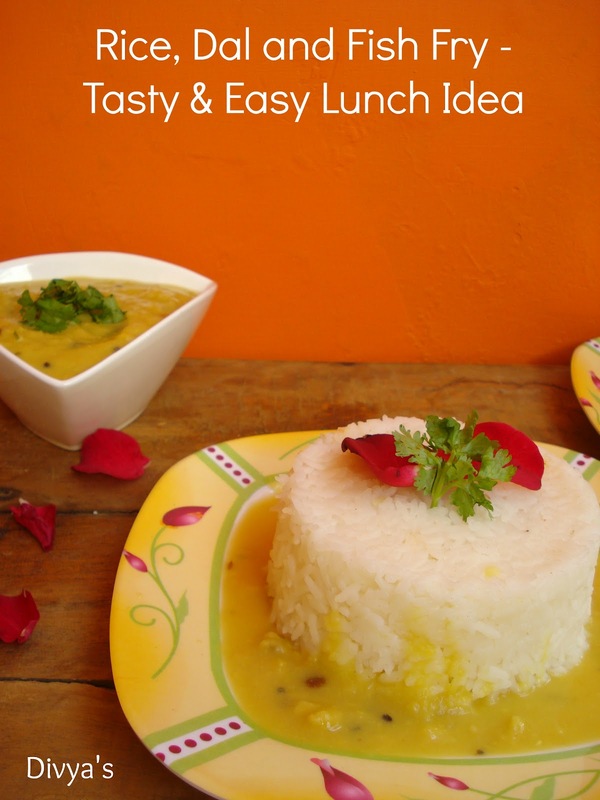 How about a delicious plate with a main course, gravy and side-dish, made within just 30 to 40 minutes? For a perfect lunch we always need wholesome, filling and yummy plate that has a main course, curry and a side-dish. 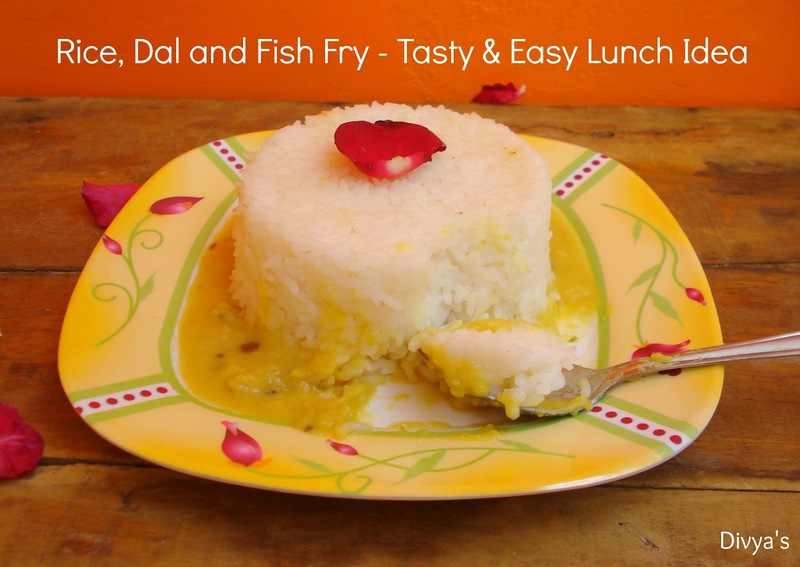 Today am going to discuss with you a complete plate filled with a main course rice, with delicious dal, accompanied by a simple side-dish fish fry that can be prepared within 30 to 40 minutes. My hubby takes his lunch packed to office along with him in the morning and I always have only 30 minutes left out to prepare his lunch (basically because I wake up late). So I try to make the best preparations within the possible time and I know many of you will have to hurry just like me, hope this post helps you. 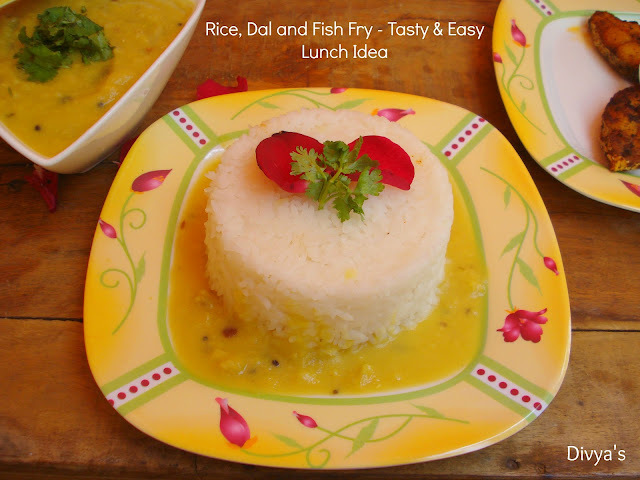 Rice accompanied with dal is my comfort plan for packing his lunch. 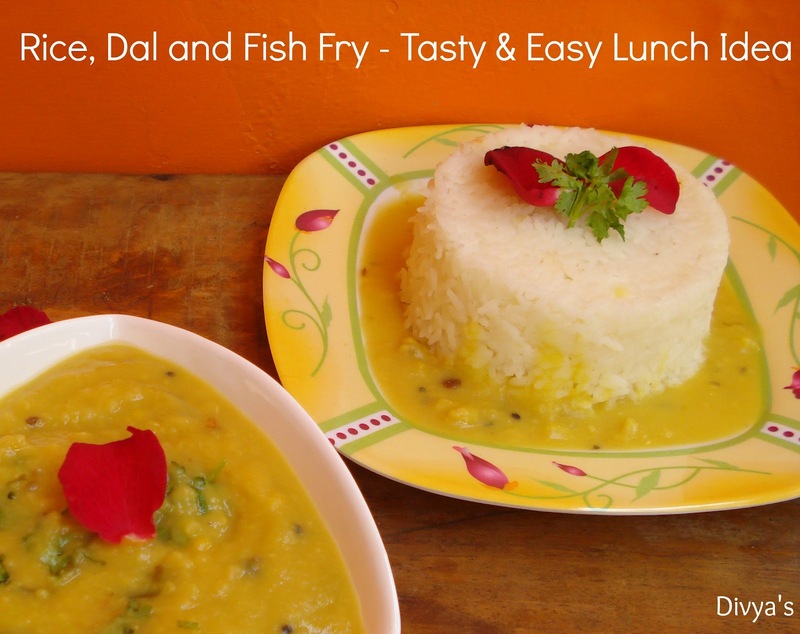 I prepare some papads or easy fry recipe to accompany dal and rice. While preparing the dishes I soak rice 5 minutes prior to cooking, I do other work like cleaning veggies, chopping or grinding masala etc in the mean time. 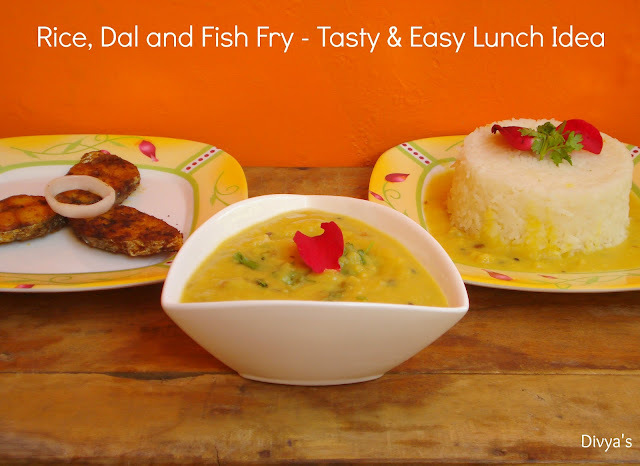 Then I cook dal and rice simultaneously at the same time on two burner tops, I wash the fish pieces and marinate them with masala in the meantime and get them ready for frying. 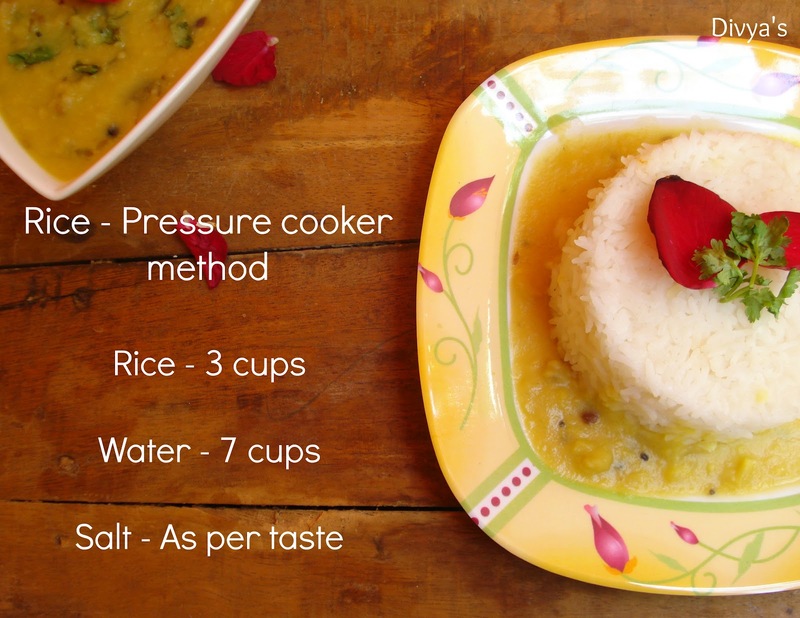 All this just takes 30-40 minutes and all the 3 recipes are very easy too cook, am using pressure cooker for preparations so that I can save time. Any doubts in the preparations please contact me. Hope you enjoy this yummy and healthy plate. 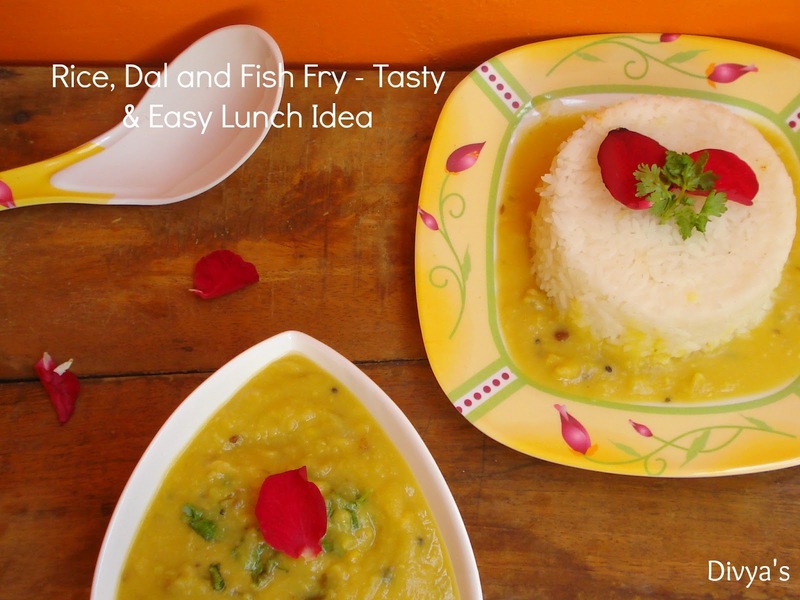 Rice with dal and fish fry makes a very yummy combo and am sure you will love this idea, for vegetarians I have discussed a spicy brinjal fry. Its so simple to make and can be prepared in just 15 minutes; but tastes so yum and provides you the necessary proteins for the day!! Take a pressure cooker and add all the washed lentils into it. Do not place on flame now. Then add water, coconut milk, cumin seeds, fennel seeds, peppercorns,crushed ginger and garlic, coriander leaves, salt and turmeric powder and stir well. Then in a tadka pan/wok add oil and heat it, after it heats up add mustard seeds and let it splutter then add curry leaves, chopped shallots and saute well until the onions turn brownish. Add the above mixture into the cooker along with the dal and stir well. Close the lid and place on flame. When steam starts to ooze out of the cooker lid nozzle place the whistle and set on low flame. Cook for 10 minutes and remove from flame. 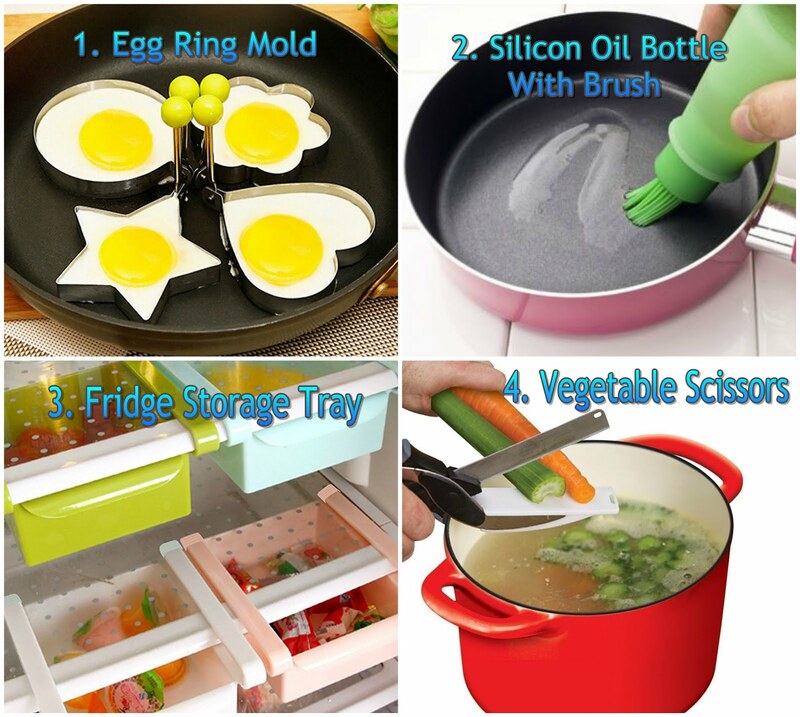 Set aside and open the cooker only after all the pressure releases. For a more simpler and easier dal recipe click here. 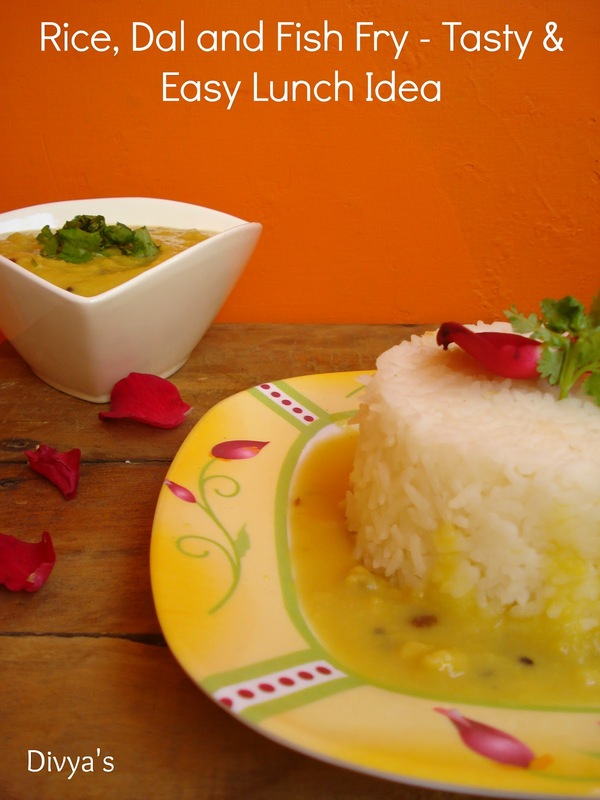 And for chana dal gravy click here. Provides you the necessary energy for the day, has lots of carbohydrates. Wash rice thrice in water and set aside. Take a pressure cooker (I used a 5 litre volume cooker, don't use cooker less than 5 litres). Add the washed rice into it add water and salt, stir well and close the cooker with its lid. Place on flame and wait till the pressure (or steam) oozes out of the nozzle. Now place the whistle and lower the flame. 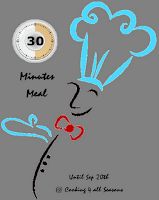 Cook for perfectly 10 minutes from the minute you place the whistle. Remove from flame and please wait until all the pressure gets released, do not try to open the lid before that, or don't try to release the pressure. Leave it undisturbed until the pressure releases fully on its own. Click here for the easiest fish fry. Use any fish of your choice, tastes best with any fish. Spicy Brinjal Fry / Spicy Eggplant Fry click here for recipe. 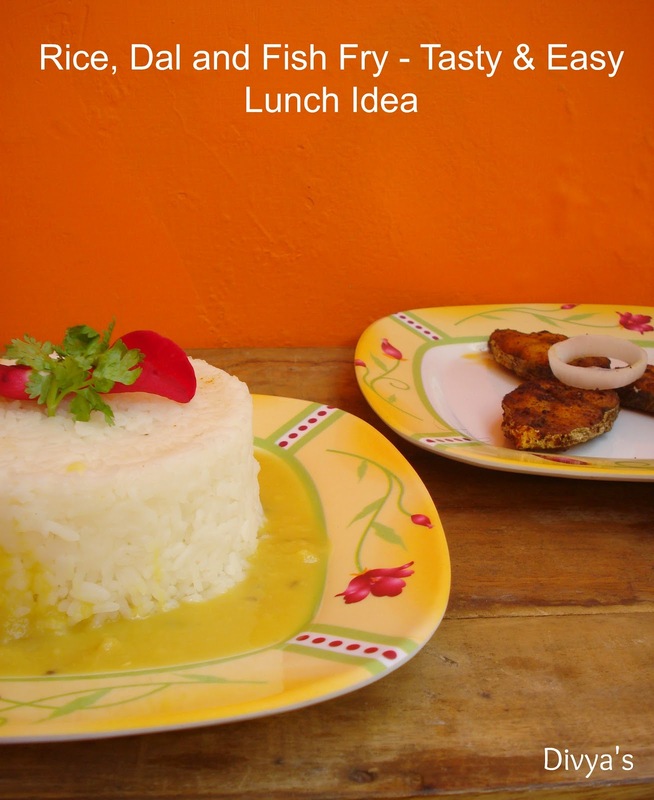 Easiest side-dish using brinjals/eggplants. Hope you enjoyed this delicious plate!! Will discuss more in the upcoming days!! 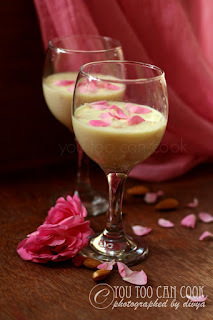 And friends...please do check out my guest post 'Nei Urundai' at Meena's space and share your feedback!! Linking this yummy plate to..
delicious dear ..Ongoing event : Fast Food Event - Noodles. Divya, this is my son's favourite meal..whenever he comes home from USA..this is the first meal he prefers to have. 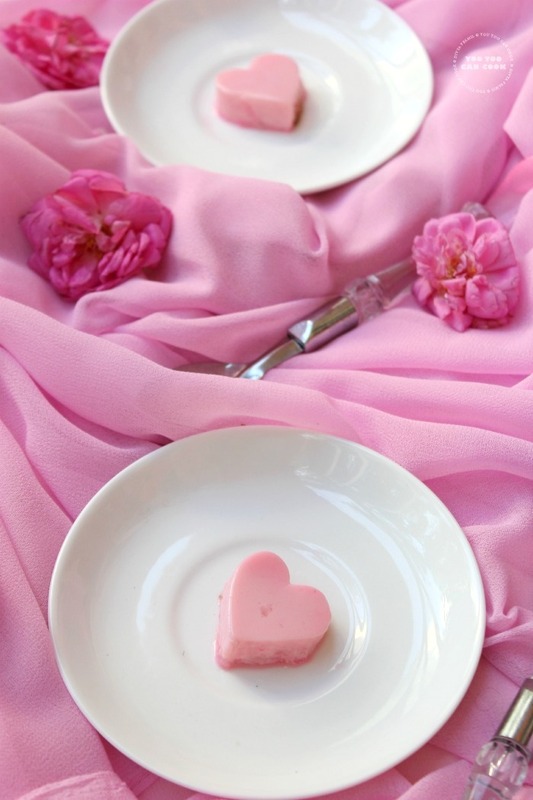 A lovely lunch theme. This is day to day lunch for us, i.e. Bengali communities. Like it. 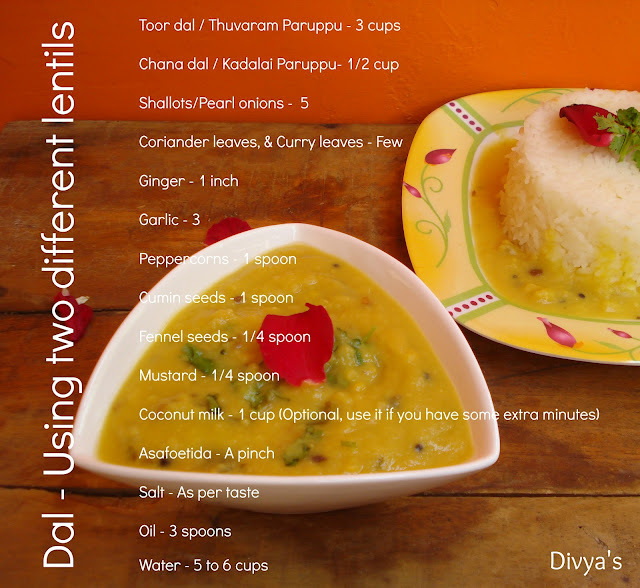 we have usually rice ,fish fry and tomato rasam too...it seeems nice combi too..vl try..so divya..r u from kerala? No dear am from Tamil Nadu :)Are you from Kerala..? Delicious combination. Awesome lunch or dinner. 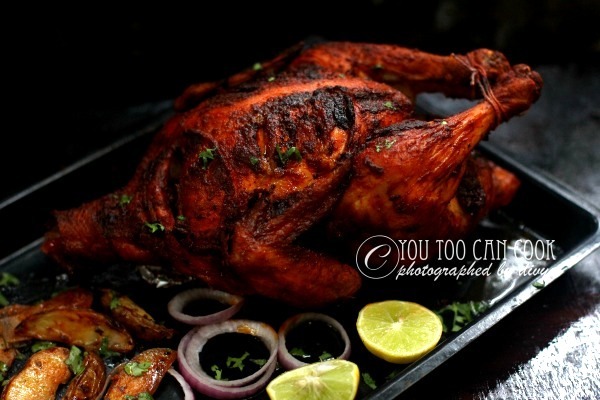 Delicious and comforting spread of dishes.. Love it. Very healthy and easy lunch. Delicious lunch! 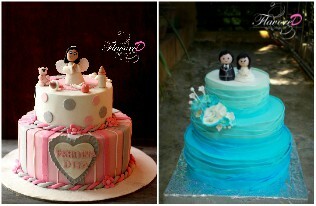 very nice clicks! Inviting foods, comforting and satisfying. 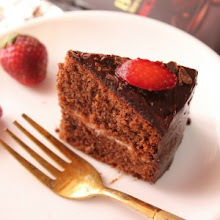 When ever we visit the coastal region this is the kind of food we eat, when are u inviting me Divya :)) I drool at ur posts! 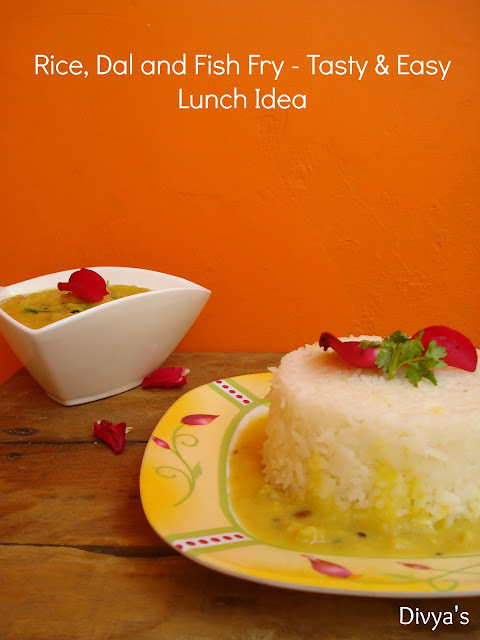 Wow this very nice and healthy lunch recipe.